A vigorous, robust treatment of finely woven classical material. 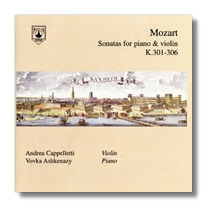 Vladimir Ashkenazy's son, Vovka, and Andrea Cappelletti work well together, each catching the other's moods adroitly. Both are lyrical sensitive performers, while Ashkenazy has an uncanny sense of melodic development and a brilliant technique. The rich, warm tone of Cappelletti's Stradivarius violin (1727) makes for heady satisfaction. This is vintage Mozart – expansive and well balanced by the contrasting instruments – delightfully scintillating in performance during a joyous collaboration that never loses its feet.